I want to say some story about my experience of deleted photo recovery. Recently, my family celebrated the birthday of my younger daughter. During our holiday, my daughter asked me to show her all the pictures that we took on the camera. I gave her the camera and after a few minutes she told me that she couldn't see anything on the screen of the camera. It was awful - she had deleted all our photos. I understand that it was a folly to give her a camera - she is only a kid. After the holiday, my friend told me of a program which could recover deleted photos from memory cards. It was called PANTERASoft - Flash File Recovery. Originally, I didn't think that it is possible but the program proved me wrong. After I ran the program, weighing only 850 kilobytes, it began to scan my Compact Flash card. It took a while as I use a 512 megabyte card, but finally almost all of my deleted image files were restored. I was really happy. Now I have all photos from my daughters fifth birthday. Some final notes I'd like to have made. First of all, the time it takes to scan the card depends on the size of the card. If it is bigger that 256 megabytes, it takes the program quite a long time. Also, you can use the of "Fast Scan" option if the photos were deleted recently. It takes less time for finding all the images. Secondly, I used a Compact Flash adapter for the finding the deleted images, but Flash File Recovery works with the most digital cameras directly. After detection of all the files, the program shows previews of all the photos. 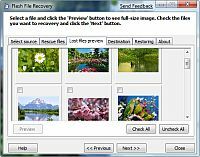 In the "Destination" tab, you choose a folder where all recovered photos are to be saved. It is very useful, because then you know where the photos are after the completed process of restoring the photos. In conclusion, the program effectively recovers lost photos and it takes less time then the Scanning process. The program by Pantera Software works, really well, I might add! Now I'm not afraid of any extreme situations like my sister deleting my pictures. I can now restore any deleted photos from my camera.